Chickpeas, also known as garbanzo beans, are practically a staple ingredient in Middle Eastern cooking. They are the basis for foods like hummus and falafel and, while it is convenient to use canned chickpeas, dried chickpeas really are a better option. 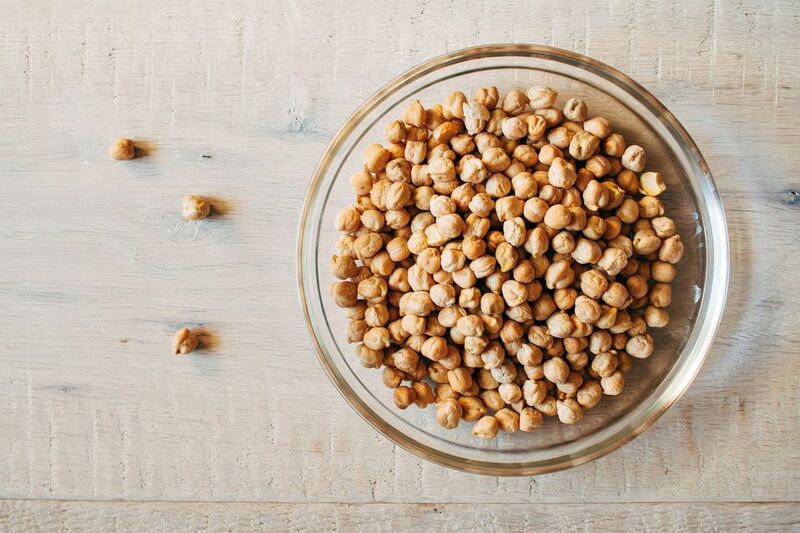 Dried chickpeas are much more economical and they tend to have a more natural flavor because they aren't soaked in preservatives. Also, any extra beans can be frozen to be used at a later time. The only drawback is that you have to soak chickpeas before you can cook them. We'll tell you how to do both so your family can enjoy these tasty little morsels. Just as with any other dry bean, the first thing you will have to do before cooking dried chickpeas is to soak them. It's best done overnight but if you forget and are in a pinch, there is a shortcut you can take. We'll get to that, but first, let's take a look at the traditional method of soaking. Sort through the beans to make sure there are no stones or debris, removing any that you find. Place the chickpeas in a large bowl and cover completely with cold water. Allow to soak overnight, or about 12 hours. A teaspoon of baking soda can be added to aid with the soaking process, but plain water for 12 hours works tends to work just fine. Sort through the beans and remove any stones or other debris. Place them in a colander and rinse under cool running water before draining. Transfer the beans to a saucepan and cover with 2 inches of water. Bring to a boil, cook for 1 minute, cover and remove from the heat. Leave the beans to soak for 1 hour, then rinse and cook as you would if you had soaked them overnight. Once the chickpeas have soaked, it's time to cook them. It's very easy and takes just over an hour. Drain the chickpeas in a large colander and transfer them to a large cooking pot. Cover with water twice the amount of the chickpeas and bring to a boil. Cover, lower the heat and allow the pot to simmer for approximately one hour. Do a taste test to make sure they are tender enough for your liking. If they're not quite where you want them, simmer for a little longer. Drain and allow to cool for 15 minutes. Once the chickpeas are cooled, they are ready to be used. Cooked chickpeas can be kept covered in the refrigerator for up to three days. They can also be frozen in an airtight container for about a month. What on Earth Are Giblets, and Are You Actually Suggesting I Eat Them? What Are Some Strategies for Tenderizing Giant Okra? Are You Seasoning Your Steaks the Right Way? What Is Horseradish and Why Is It Hot?